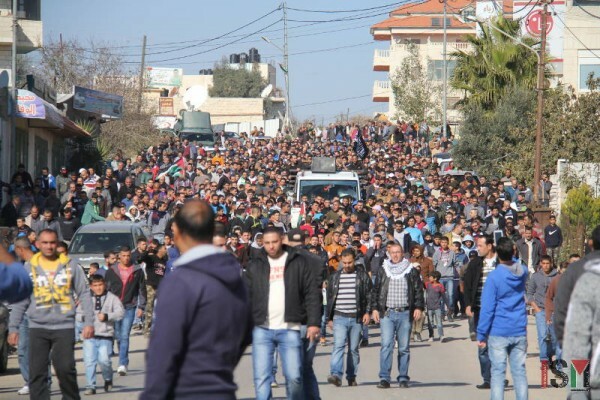 On Friday the 11th of December, hundreds of protesters gathered in the village of Silwad, Ramallah area, in a demonstration demanding the return of the body of Anas Bassam Hammad who was killed on December 4th by Israeli soldiers. 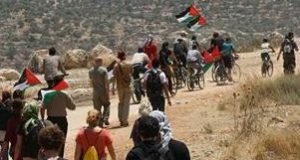 After the Friday prayer, the protesters marched towards the eastern entrance of the village near road 60 when Israeli forces attacked the demonstration using tear gas, live ammunition, rubber-coated steel bullets, hollow point bullets and foam tipped bullets. Protesters marching towards the eastern entrance of Silwad village. 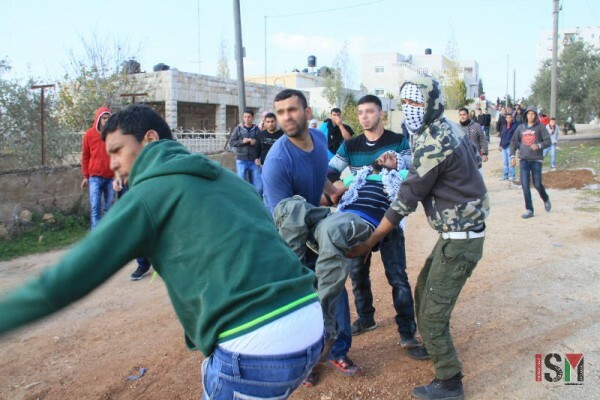 22 Palestinians were injured according to International Middle East Media Center (IMEMC), seven of them injured with hollow point bullets – also known as “dum dum” – which detonates on impact causing severe damage and therefore are declared illegal under international law. A young man was seriously wounded when shot in his abdomen having his liver penetrated by bullet fragments which afterwards came out through his back. Another young man suffered a moderate injure after being shot in his abdomen. Injured youth carried towards ambulance by locals. 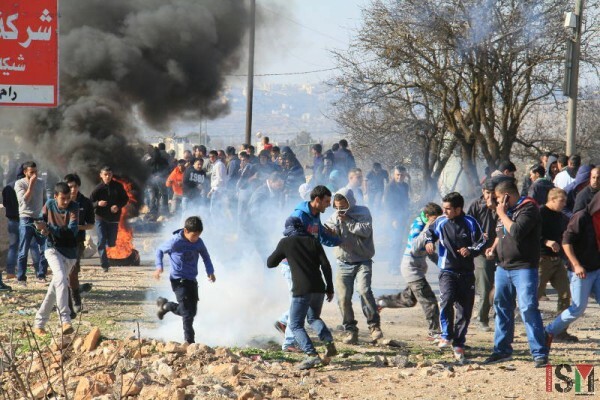 In addition, sources state that fifteen Palestinians at the demonstration were shot with rubber-coated steel bullets and many suffocated after tear gas inhalation. 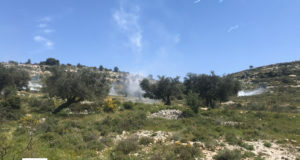 In the village, a family of five suffered the effects of tear gas inhalation, after having a gas bomb fired by Israeli forces into the home of the family. A young female family member was severely injured in the retina of her eye as a consequence of the tear gas. 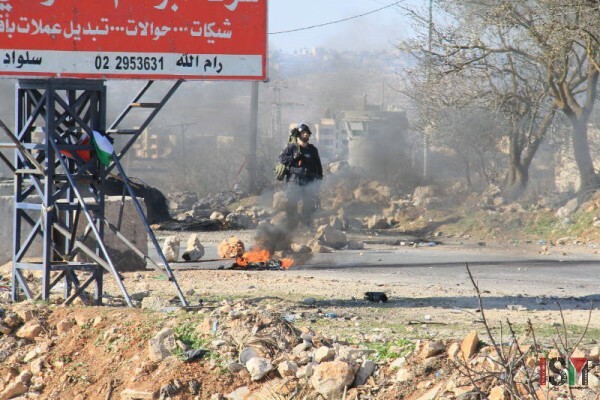 Demonstration attacked with tear gas shot by Israeli forces. Furthermore, medics were targeted as Israeli soldiers opened fire towards a Red Crescent ambulance, damaging its windshield. Another ambulance was searched by Israeli forces while taking a wounded Palestinian to the hospital. Palestinian journalists were also targeted with the wide range of weaponry, wounding a Palestine TV-reporter. In addition, many journalists suffered from tear gas inhalation. 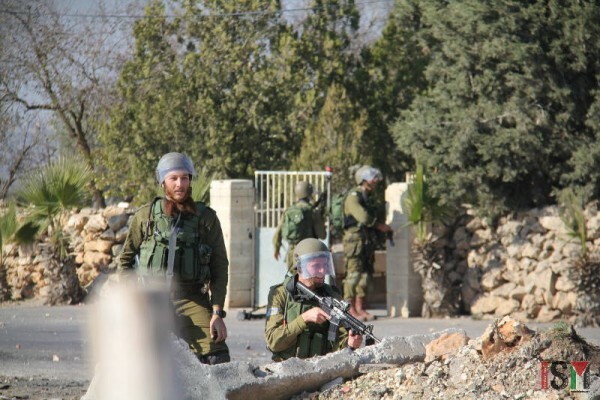 Soldiers preparing to shoot at protesters in the village of Silwad. The refusal of the Israeli government to return the dead body of Anas Hammad to his family follows a common pattern of violating both Israeli and international humanitarian law. Israel continues to evade it’s obligation to return the bodies of dead Palestinians to their respective families. 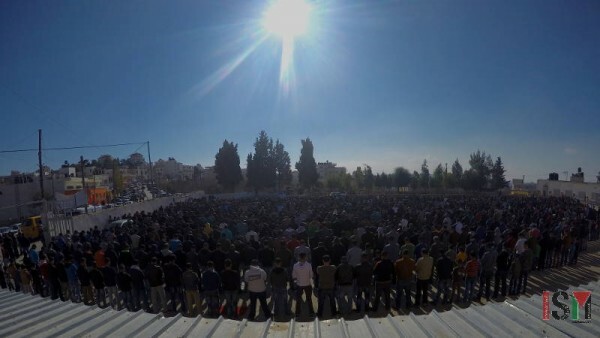 Locals gathering in the Friday prayer before the demonstration. Israeli border police walking towards protesters.